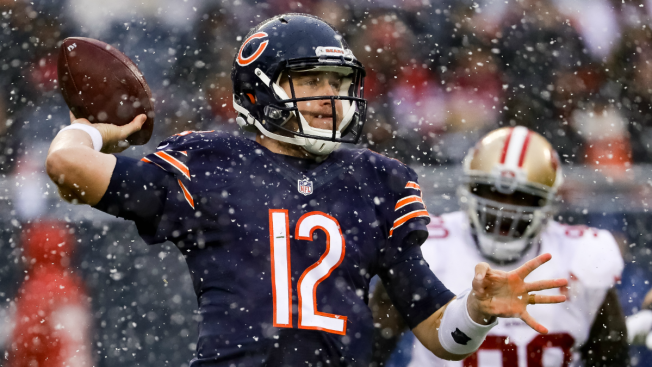 Quarterback Matt Barkley #12 of the Chicago Bears throws the football in the second quarter against the San Francisco 49ers at Soldier Field on December 4, 2016 in Chicago. Take a game between two teams with a combined three wins on the season, add a healthy helping of snow, and you get some NFL history as the Chicago Bears and San Francisco 49ers set a mark for futility in their game on Sunday. In the first quarter of the game, 49ers quarterback Colin Kaepernick and Bears quarterback Matt Barkley combined to attempt three passes, none of which were completed. According to the good folks at Elias Sports, the game's dismal beginning marks the first time both teams have combined for zero completions in an NFL contest since the 1988 season, when the New York Jets and New England Patriots accomplished the feat during their November match. This time, the Bears and 49ers completed zero passes combined for the first 22:30 of the game, until Colin Kaepernick finally found Vance McDonald for a four-yard completion. That completed pass was the only one made in the first 28 minutes of the game as the two teams dealt with snow and cold conditions.